Weekends are for unwinding and spending time with my son. On Saturday morning we popped into Target for my usual Green Tea Latte from Starbucks and then headed to the library. I'd been hoping to find the next book in the YA series I'd just finished, but my branch doesn't have a copy. They did have a copy of another YA I've been reading occasionally on my cell phone. Since I stare at a computer all day at work, I'm not anxious to stare at my phone on my lunch break, so I grabbed the book-on-paper version. Then we went to check out the kids section. And dur, why didn't anyone tell me there were fun things at the library besides books? Blocks and trains and stuffed animals, and needless to say, we'll be going back when we have more time. I do wish they opened earlier on the weekends. When your kid wakes up at 5:30am, waiting until 10am for things to open is not always ideal. We picked out a board book about pumpkins for him and then headed to our next destination. 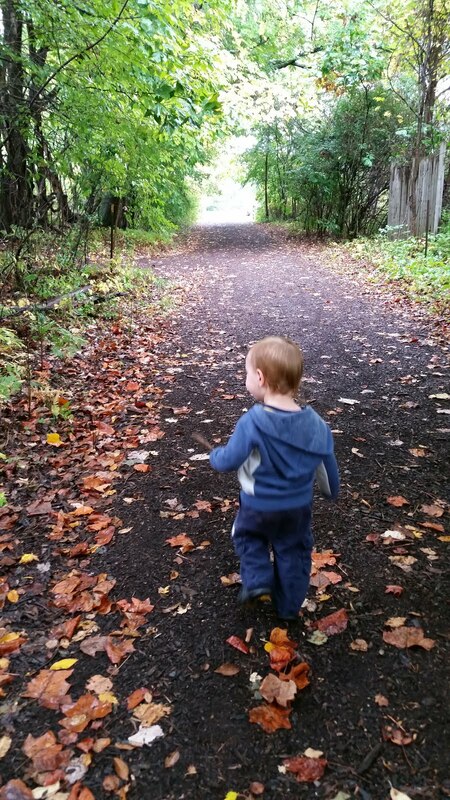 I'd been hoping to do some walking at the nature center, but the rain put a damper on those plans as I can't find the hand-me-down raincoat from my nephew. I wouldn't mind a little drizzle, but it was pouring while we were at the library. So we went for the pancake breakfast only. My guy sat in a booster seat and ate like a bog boy. It was impressive and tasty. He loves signs. 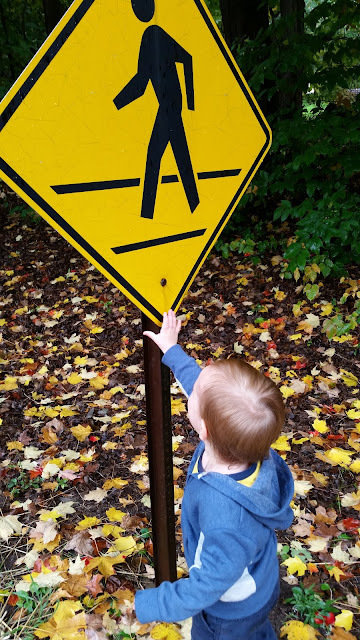 What is it with little boys & signs? After his nap and the rain we played in the yard for a little bit and he got to stomp through some puddles in his dinosaur boots. On Sunday morning we did our grocery shopping as usual and played outside for few minutes before lunch. 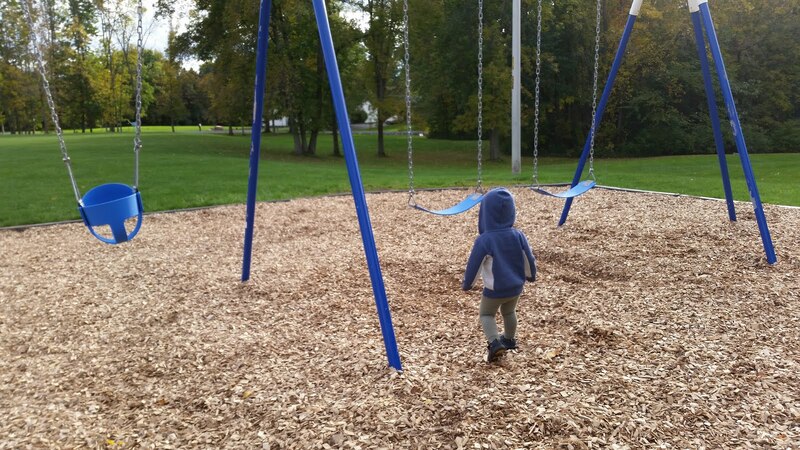 After nap I put him in the stroller to check out the newly renovated neighborhood park. He refused to get in the baby swing but happily rode on my lap in the regular one. Then he hopped down and climbed the stairs, presenting me with a big parenting moment. 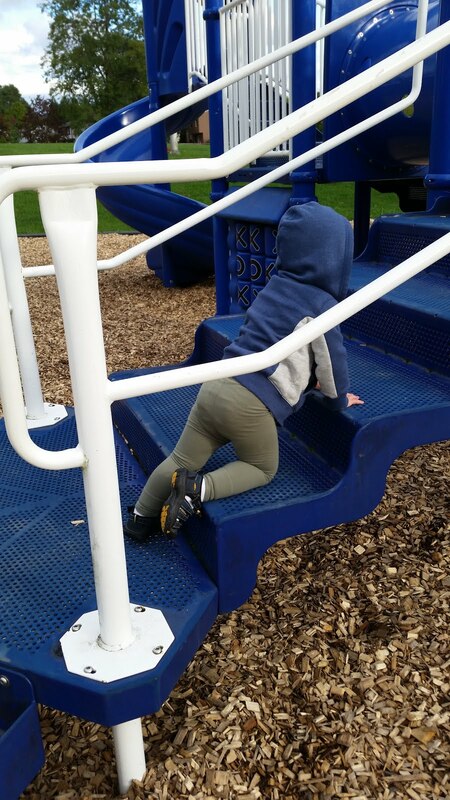 He wanted to go down the slide and I did not (my wrist still hurts from the last time I took him down that slide), so my only choice was to let him go by himself without any help and without anyone at the bottom to catch him (single parenting, yo). He did great and he loved it. Phew. After climbing the stairs and going down the slide a second time, he was done and went back to the stroller. Short attention span, this one. And that was pretty much it for our weekend. How was yours? Linking up with Karen at Pumpkin Sunrise. Sounds like a good weekend. I remember those early morning wake ups...it gets better, they do eventually sleep a little longer :) I like having the book in my hands too, feels more real to me. Hope you are having a great week.